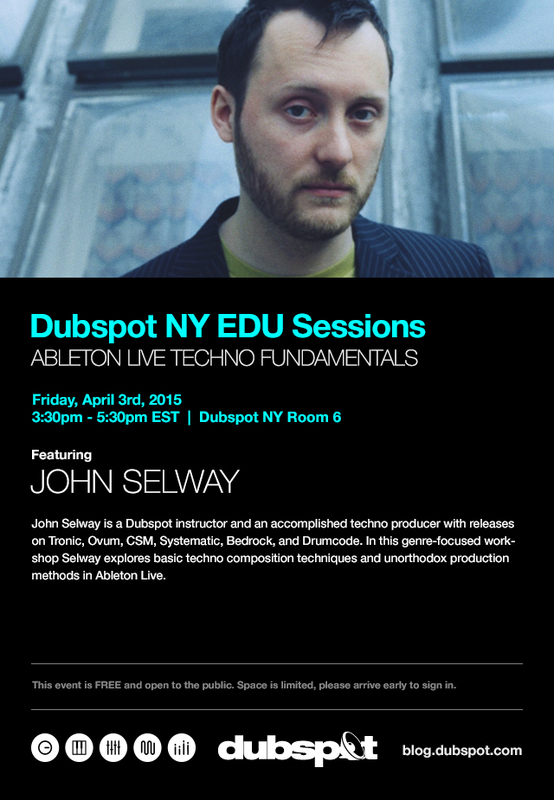 On Friday April 3rd, our NY EDU Sessions continue with a free workshop hosted by Dubspot Instructor and an accomplished techno producer John Selway exploring basic techno composition techniques and unorthodox production methods in Ableton Live. Join us for a free workshop hosted by John Selway, Dubspot Instructor and an accomplished techno producer with releases on Tronic, Ovum, CSM, Systematic, Bedrock, and Drumcode. In this genre-focused workshop, Selway explores basic techno composition techniques and unorthodox production methods in Ableton Live. Born to music teachers and trained from youth as a multi-instrumentalist, John Selway has been in the mix from the get-go. Taking up electronic dance music from his home base in NYC in the early ’90s, John has faithfully represented his town at every turn. As an artist, a record slinger, a label owner and more, he is a musical force to be reckoned with and a bona fide pillar of the scene. Without going too deep into the litany of names we could check, trust us when we say the man’s resume is unparalleled. Selway has blazed many paths, collaborated with a variety of talents, played nearly everywhere, mastered numerous styles and broken a few boundaries, risen to techno stardom and never forgotten his roots. So many a DJ and producer who are respected worldwide will admit to being mentored at one point in their career by this true innovator.